Dodging the weather has become a bit of a theme for Mark and myself of late, going from the freezing cold, and hypothermia inducing flying needles of ice rain at stunningly beautiful Llyn Idwal to the temperamental and squally weather of Penarth Pier. All things consider the weather although unsettled did provide an ever-changing sky that lent its self well to some long exposures and detailed shots. Due to the shorter days and in turn longer nights, sunrise wasn't till around 8 am, this gave myself a much enjoyed lie in from the previous adventures in 2016, still the drive to Penarth takes around 1 hour 50 mins from Worcestershire and with our intention to always get to the planned location an hour or so before the blue hour this still required us to be on our way by 04:00 am. Photgraphy tip, get on location early! This early start rule has paid dividends in the past, not only does it allow you plenty of time for you settle at the shoot, it gives you chance to understand the environment that you are in, consider compositions and adjust to the prevailing light and weather. I always find having a few minutes to adjust also helps settle any nervous energy and anxiety which may have built up in anticipation of the adventure. So, do plan and give yourself a little more time than you would do normally. It really helps. Arriving at Penarth around 6 am, It was still very dark, heavy rain clouds covered the night sky and a strong gusting wind was sweeping in from the sea. A couple of early morning fishermen had setup up on the sea wall and were chatting to themselves about the ones that got away, no doubt. For those who haven't visited Penarth Pier, you will be pleased to read that car parking is almost perfect, with a two way road with ample parking spaces running parallel to the sea wall, from which the Pier projects, obviously, If you are their early enough, you can have your choice of parking space. Getting out of the car and stretching my legs and breathing in some fresh sea air, I stood and watched the fishermen for a while, it didn't seem as though they where having much luck. Wet weather jacket on, walking boots laced and camera pack on back we set off to explore our new location. 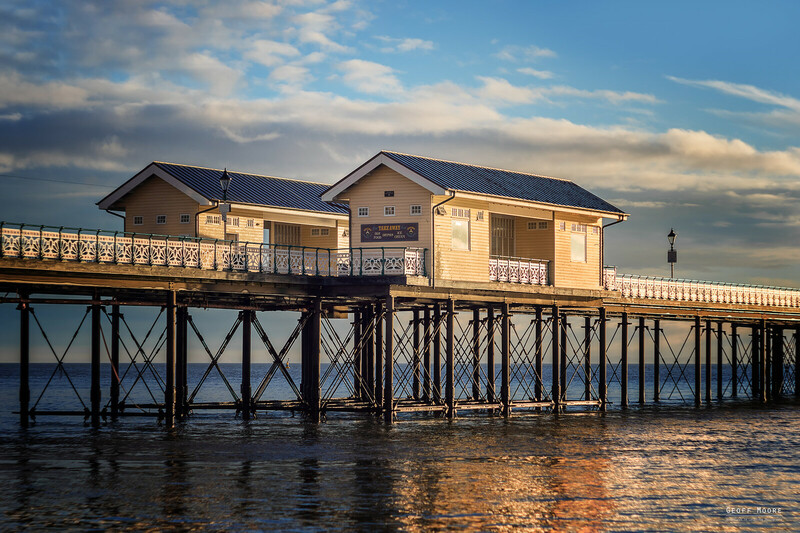 The Pier at Penarth, Vale of Glamorgan, South Wales was opened in 1898 and was a popular attraction to seaside-goers at the time, who also enjoyed trips on pleasure steamers that operated from it. It has on several occasions been damaged by vessels colliding with the structure and in 1931, a fire broke out in one of the pavilions. With today's health and safety and security considerations access to the Pier was gated off until and a sign posted on main access doors suggesting that it would be open to the public at around 8ish, this both Mark and myself a good hour or so to explore either side of the main structure. From either side of the pier views can be had of it stretching out into the Bristol channel, it really is as simple as following the public footpath left or right of the promenade. Illuminated by a series of lights on the decking, the out buildings on the pier make for interesting subjects comprised of wooden buildings stretching the full length at 650 feet (200 m) it was 750 feet (230 m) but I suspect the aforementioned accidents took a few meters off. Walking the public foot path to the left of the pier as you face it, provide views of the transit routes for cargo containers and boats destined for the busy Cardiff Docks which can also be seen, where as walking to the right of the pier gives view out into the Bristol channel and the town sea wall and jetties. With morning breaking, the outside of the Pier had come to life in a bustle of activity as around a dozen or so photographers appeared on the path awaiting the Pier to open, with them jostling for position in the queue, watching the unfolding chaos I decided to stay put, relax and enjoy the dawning of a new day. On hindsight I should have also entered the melee as I ended up not taking any photos actually on the pier itself. something I now regret, however all was not lost Mark managed to capture a stunning shot of the wooden decking, much to the angst of the other photographers as he was set up right in front of their composition, I must stress not intentionally. Having regrouped a short while later Mark and I chatted a little about our respective shots whilst watching the gaggle of photographers vying for prime position, early bird and worms springs to mind.